A good carrying bag is something you should never be without whenever you hit the renaissance fair. And this Leather Shoulder Bag is just that, allowing you to easily shoulder your burdens, while carrying along all sorts of other items you might need, too. This handsome leather bag is crafted entirely in 100% real leather and made of sufficient size that it makes carrying all sorts of items much easier. Books and other such amenities fit into this bag easily, as does anything much smaller, allowing for the owner to carry about all sorts of surprises. The bag features an adjustable, buckled leather shoulder strap, as well as a loop and button closure that keeps the flap closed. The flap is decorated with a stitched leather trim that is accented by a secondary color that varies depending on the original color. If you get a black bag, it comes with brown trim, and if you get a brown bag, it comes with black trim. The bag measures approximately 7 inches tall and 10.2 inches wide. 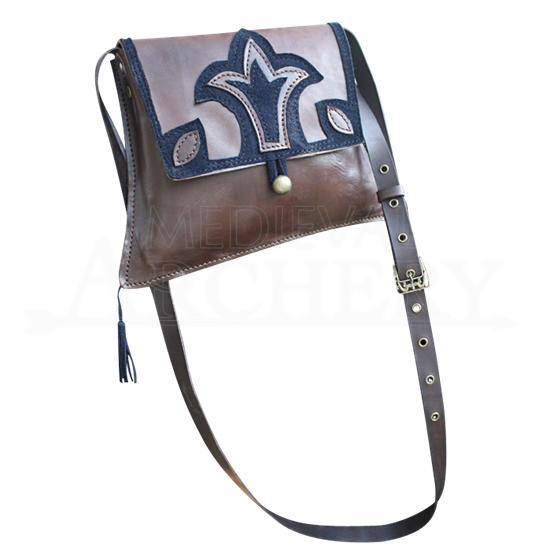 It is a handy little addition to add to your fair-going kit, especially because it makes things much easier to handle and carry, and in a pinch, this Leather Shoulder Bag can also make for a great prop, too, for monks, medieval doctors, and more!